Clothing Sales Associate working for the clothing stores welcomes and greets the customers first and makes them feel comfortable and renders support in selecting the apparel or accessories, the Clothing Sales Associate Resume sample is saddled with certain other responsibilities that include understanding the customer requirements, providing with the appropriate clothing or apparel, suggesting ideas to promote sales in a positive manner, guiding the customers with the latest styles and designs, displaying new stocks, providing correct cost price to customers, coordinating with the stores section to ensure all sizes are available and adhering to “white Glove” shopping environment. 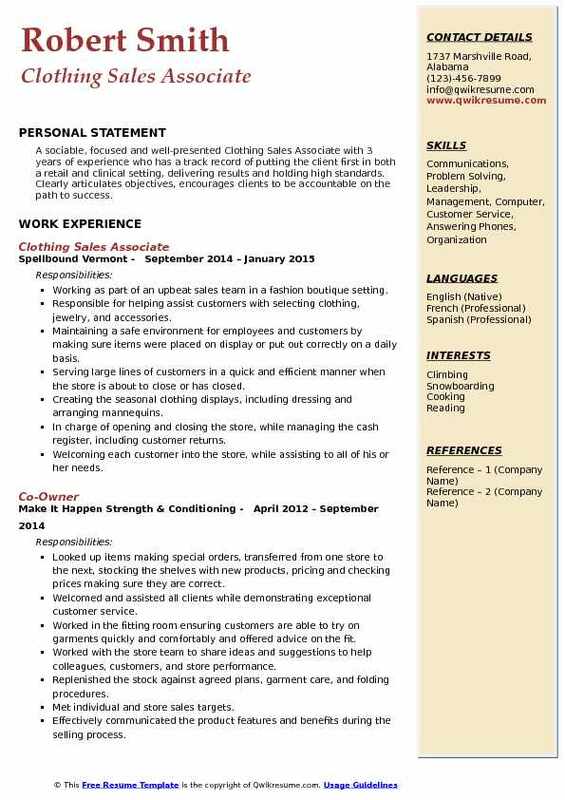 A clothing Sales Associate to become successful in this line has to possess an engaging and friendly personality, must be helpful and polite, look pleasing and have inventory technique awareness. No Formal education is needed to become a Clothing Sales Associate, even though a High School Diploma is considered to be a plus. Summary : Clothing Sales Associate II with 15 years of experience in the Clothing sales domain is seeking a position within a reputable organization where I can use my skills and experience for the companies profitability. Provided excellent shopping environment to customers and generating maximum business results. Wished the customers on their birthdays and anniversary through SMS and emails. Guided and recommended the clothes to customers matching with their personality. Greeted and obtained information on customers needs and showed them ranges of clothing materials. Selected dresses as per customers choice and preference and convinced them for a trial. Accepted dresses from customers returned for losing color and getting shrunk after one wash. Operated computerized sales tracking systems and updated sales transactions. Maintained social media pages by posting content and engaging with potential consumers. 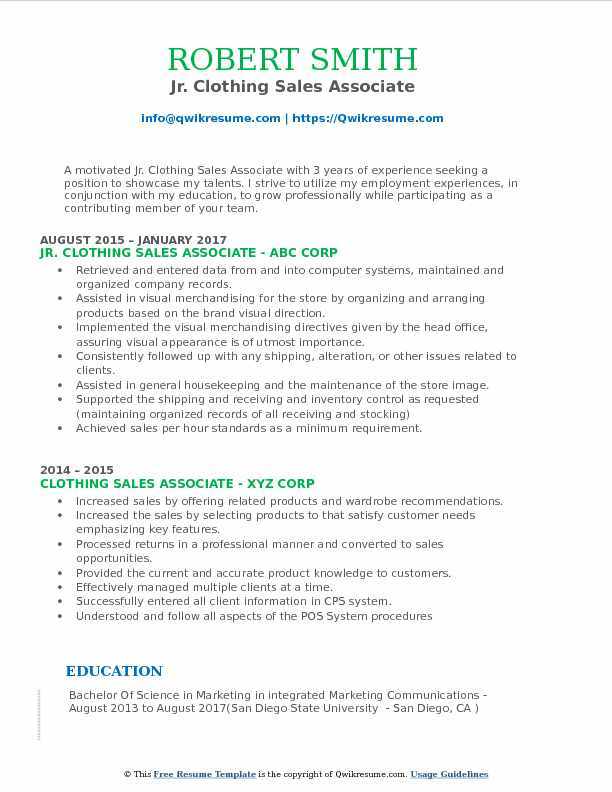 Summary : Goal-oriented Clothing Sales Associate with 18 years of experience in Clothing Sales, dedicated to high levels of customer satisfaction and meeting aggressive business goals. Dependable and efficient with specialized knowledge in retail. Processing memberships, upgrading and crediting the accounts. Participating in sales and marketing events in an effort to achieve store goals. Selling the clothes by identifying customer needs and sizes. Process sizing and other requests. Receiving and stocking the merchandise. Inventory and secure merchandise at the close of business. Processing the returns, clothes related services, and special orders. Maintaining the cash registers and lanes. Maintaining the availability of and organizes cart/flatbeds. Assisting the customers with transporting items safely. Assisting the customers in locating merchandise and purchasing decisions. Resolving the issues and concerns, promoting products and services. Following the procedure for detecting concealed merchandise. Scheduling the breaks for cashiers, performing register overrides, providing cashiers with updated product codes. Summary : Senior Clothing Sales Associate with 11 years of experience in the Clothing Sales, is seeking to obtain the position of clothing sales associate with a view to utilizing my experience in the field of sales contributing towards effective service in a renowned retail store. Responsible for interacting and communicating with customers on phone or in person to determine and meet their merchandise requirements. Responsible for responding to customer queries and update latest upcoming dress to customers. Performing the tasks of entering name and phone numbers of potential customers for future reference. Operating the office equipment, such as fax machines, copiers, or phone systems and arrange for repairs when equipment malfunctions. Responsible for providing knowledge of the fabrics and materials to customers. 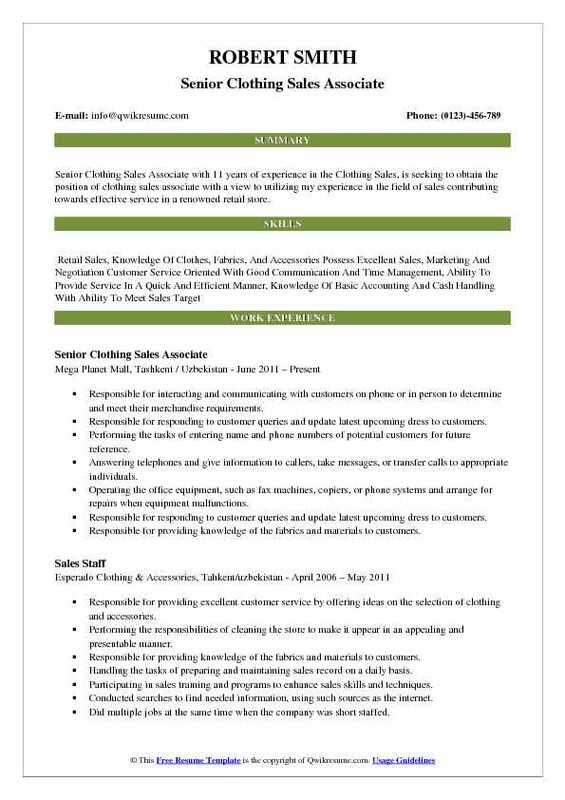 Headline : Clothing Sales Associate with 5 years of experience in Clothing Sales is seeking to obtain a position that utilizes my organizational and customer service skills. Recommended, selected and helped locate merchandise based on customers needs and desires. Provided excellent customer service while on the selling floor, fitting room and front end. Familiarity with the latest trends in clothing and likes of customers. Adept at marketing new clothing brands and negotiating with customers. Knowledge of using the computer, calculator, and operating credit and debit card swipe machine. Skilled in handling customers at rush hour and collecting payment for sold merchandise. Demonstrated ability to increase business sales and customer satisfaction level. Outstanding customer service skills and experience of clothing retail outlet. Responsible for tracking sales and making sure the register was even at the end of the day. Assisted in stocking the shelves with new product and replacing the product that had been moved during the course of the day. 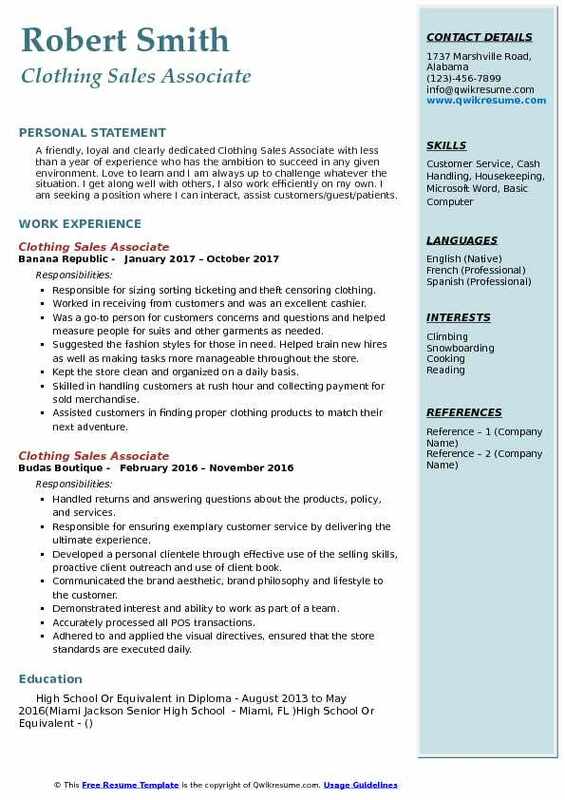 Objective : A friendly, loyal and clearly dedicated Clothing Sales Associate with less than a year of experience who has the ambition to succeed in any given environment. Love to learn and I am always up to challenge whatever the situation. I get along well with others, I also work efficiently on my own. I am seeking a position where I can interact, assist customers/guest/patients. Responsible for sizing sorting ticketing and theft censoring clothing. Worked in receiving from customers and was an excellent cashier. 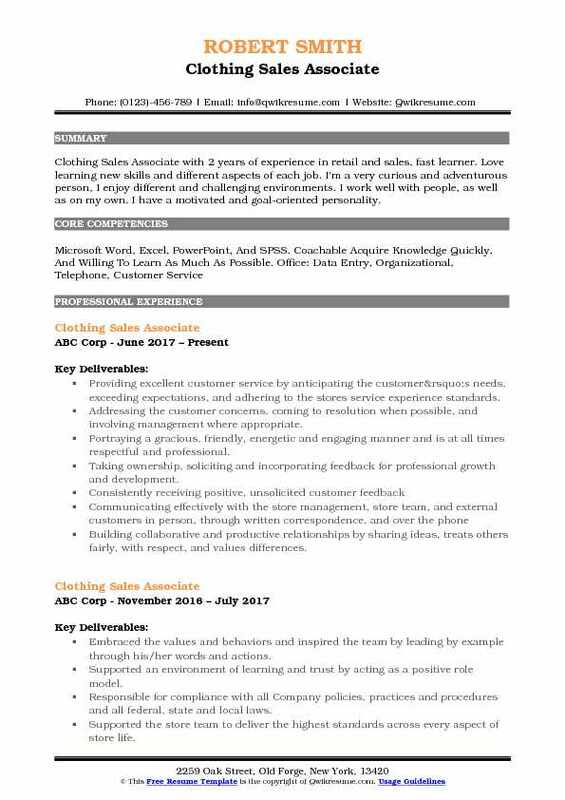 Was a go-to person for customers concerns and questions and helped measure people for suits and other garments as needed. Suggested the fashion styles for those in need. Helped train new hires as well as making tasks more manageable throughout the store. Kept the store clean and organized on a daily basis. Assisted customers in finding proper clothing products to match their next adventure. Shared the expert merchandise knowledge with customers on location, price, and use. Received multiple spot awards for customer compliments. 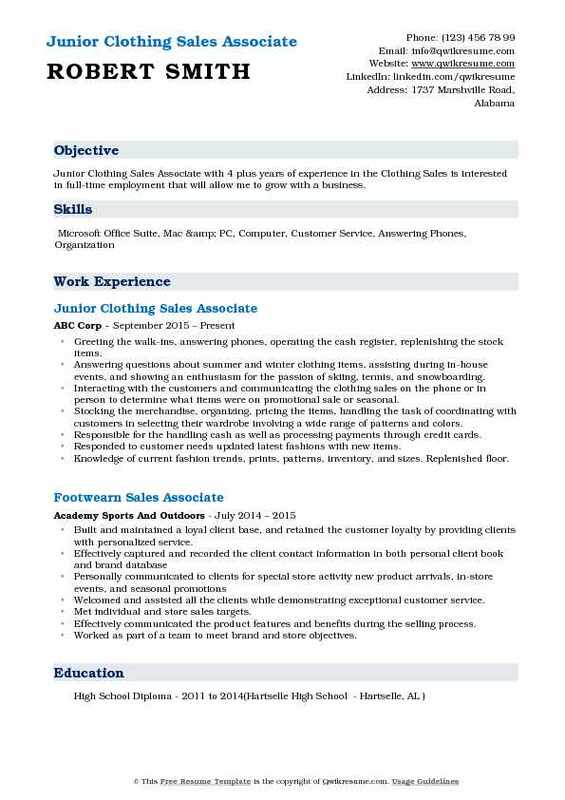 Objective : Junior Clothing Sales Associate with 4 plus years of experience in the Clothing Sales is interested in full-time employment that will allow me to grow with a business. Greeting the walk-ins, answering phones, operating the cash register, replenishing the stock items. Answering questions about summer and winter clothing items, assisting during in-house events, and showing an enthusiasm for the passion of skiing, tennis, and snowboarding. Interacting with the customers and communicating the clothing sales on the phone or in person to determine what items were on promotional sale or seasonal. Stocking the merchandise, organizing, pricing the items, handling the task of coordinating with customers in selecting their wardrobe involving a wide range of patterns and colors. Responsible for the handling cash as well as processing payments through credit cards. Responded to customer needs updated latest fashions with new items. Knowledge of current fashion trends, prints, patterns, inventory, and sizes. Replenished floor. Brainstorming new ideas to increase the sales of the store to always meet customer. Objective : A motivated Jr. 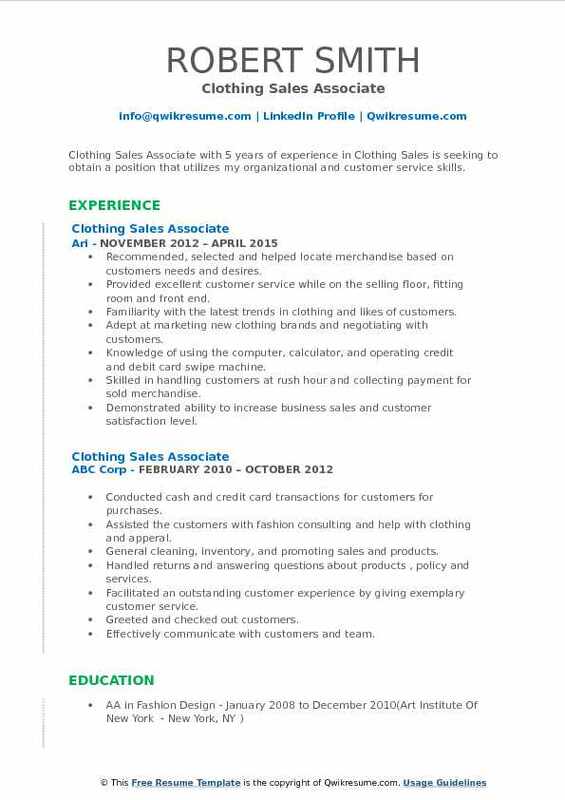 Clothing Sales Associate with 3 years of experience seeking a position to showcase my talents. I strive to utilize my employment experiences, in conjunction with my education, to grow professionally while participating as a contributing member of your team. Retrieved and entered data from and into computer systems, maintained and organized company records. Assisted in visual merchandising for the store by organizing and arranging products based on the brand visual direction. Implemented the visual merchandising directives given by the head office, assuring visual appearance is of utmost importance. Consistently followed up with any shipping, alteration, or other issues related to clients. Assisted in general housekeeping and the maintenance of the store image. Achieved sales per hour standards as a minimum requirement. Met individual sales goals by maximizing selling opportunities. 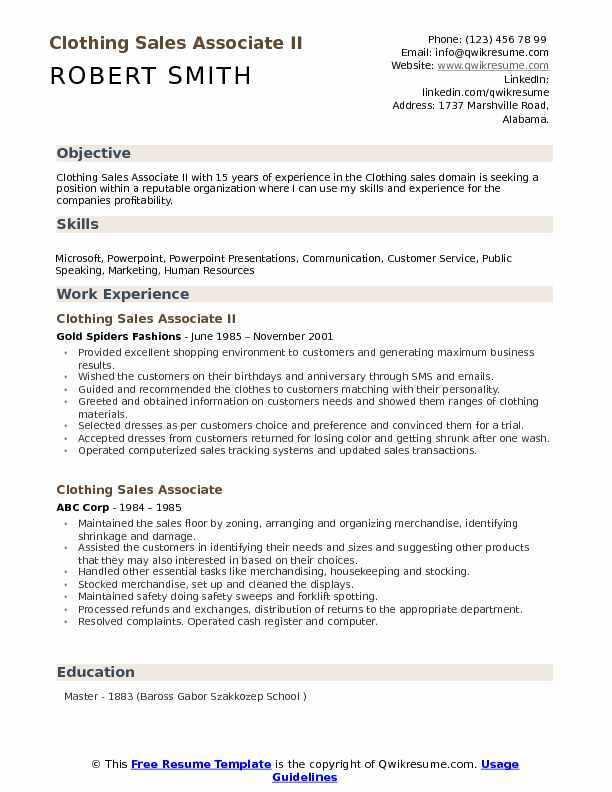 Objective : Clothing Sales Associate with 2 years of experience in retail and sales, fast learner. Love learning new skills and different aspects of each job. I'm a very curious and adventurous person, I enjoy different and challenging environments. I work well with people, as well as on my own. I have a motivated and goal-oriented personality. Providing excellent customer service by anticipating the customer’s needs, exceeding expectations, and adhering to the store's service experience standards. Addressing the customer concerns, coming to resolution when possible, and involving management where appropriate. Portraying a gracious, friendly, energetic and engaging manner and is at all times respectful and professional. Taking ownership, soliciting and incorporating feedback for professional growth and development. Building collaborative and productive relationships by sharing ideas, treats others fairly, with respect, and values differences. Objective : A sociable, focused and well-presented Clothing Sales Associate with 3 years of experience who has a track record of putting the client first in both a retail and clinical setting, delivering results and holding high standards. Clearly articulates objectives, encourages clients to be accountable on the path to success. Working as part of an upbeat sales team in a fashion boutique setting. Responsible for helping assist customers with selecting clothing, jewelry, and accessories. Maintaining a safe environment for employees and customers by making sure items were placed on display or put out correctly on a daily basis. Serving large lines of customers in a quick and efficient manner when the store is about to close or has closed. Creating the seasonal clothing displays, including dressing and arranging mannequins. In charge of opening and closing the store, while managing the cash register, including customer returns. Welcoming each customer into the store, while assisting to all of his or her needs. In charge of handling all inventory, as well as being in charge of all social media. Assisting customers in finding the right items for the customer. 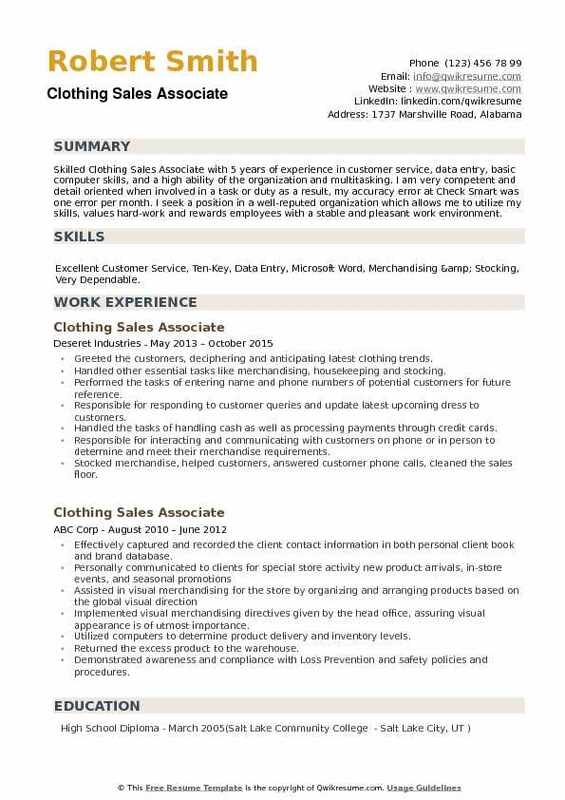 Headline : Skilled Clothing Sales Associate with 5 years of experience in customer service, data entry, basic computer skills, and a high ability of the organization and multitasking. I am very competent and detail oriented when involved in a task or duty as a result, my accuracy error at Check Smart was one error per month. I seek a position in a well-reputed organization which allows me to utilize my skills, values hard-work and rewards employees with a stable and pleasant work environment. 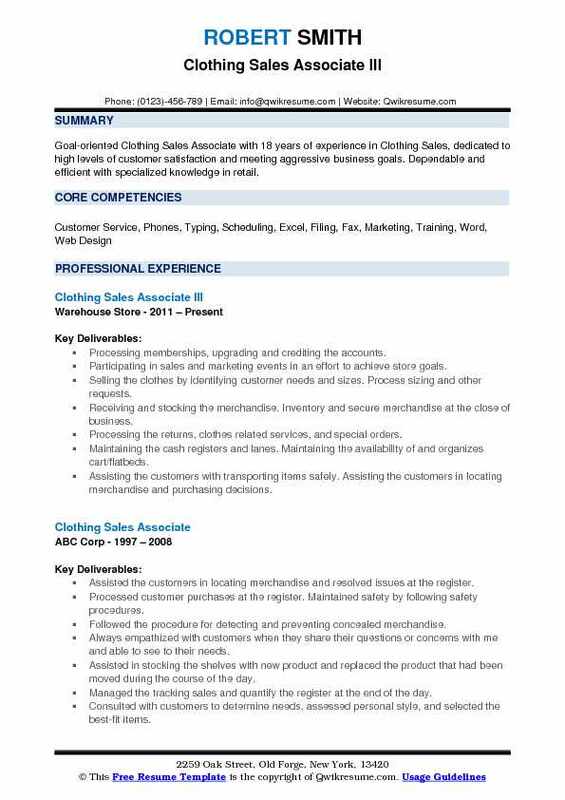 Skills : Excellent Customer Service, Ten-Key, Data Entry, Microsoft Word, Merchandising & Stocking, Very Dependable. Greeted the customers, deciphering and anticipating latest clothing trends. Handled other essential tasks like merchandising, housekeeping and stocking. Performed the tasks of entering name and phone numbers of potential customers for future reference. Handled the tasks of handling cash as well as processing payments through credit cards. Stocked merchandise, helped customers, answered customer phone calls, cleaned the sales floor.